It is officially winter! The snow is on the ground, and it’s got me thinking about curling up in front of the fire with a good book and a mug of hot chocolate! Can’t you picture a cup of this hot chocolate while the children open Christmas gifts on Christmas Eve? 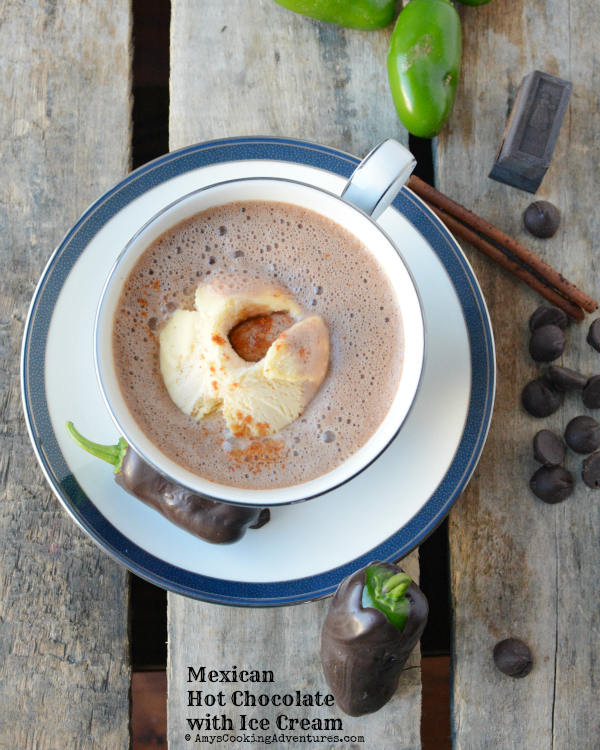 I loved the combination between sweet and spicy in this hot chocolate recipe. Plus you can totally pair this with Tequila Spiked, Chocolate Dipped Jalapeños and really have party! Using the unsweetened chocolate as a base keeps the hot chocolate from getting too sweet, especially one the ice cream starts blending in. Got a good book ready? Good, let make some hot chocolate! Place the milk and cinnamon stick in a saucepan over medium-low heat. Heat until steaming (not boiling!) then, add the sugar, chocolate, chocolate chips, espresso powder, salt, and cream. Whisk until smooth. Pour into cups. Immediately top with a scoop of vanilla ice cream and a pinch of cayenne.